Recent events have shown an unfortunate variation in the way that the Government handles issues concerning wildlife. During this month it has expressed willingness to house a couple of pandas at great cost while at the same time it has shown disregard for the future of Maui’s Dolphin by again offering Auckland’s west coast up for potential oil drilling. The cost of the two pandas, potentially the thick end of $100 million, is significant, probably comparable to the royalties the Government would receive if oil was discovered off the West Coast. And you have to wonder if it is money well spent. The Government in the past has said that Local Government should concentrate on core business. It is hard to justify the spend unless core business includes not only roads, rates and rubbish but also housing cute animals that provide good photo opportunities. There is great local concern at the opening up of the West Coast to potential oil drilling. The area is the habitat for the remaining few Maui’s dolphin. The Government is consulting on areas to be released for the 2016 Block Offer and the Northland Reinga basin is again proposed as an area. The area starts 12 nautical miles out from the coast. Oil rigs this far out would be easily visible from the shore. During the last Block Offer consultation Auckland Council voted on the form of its submission. 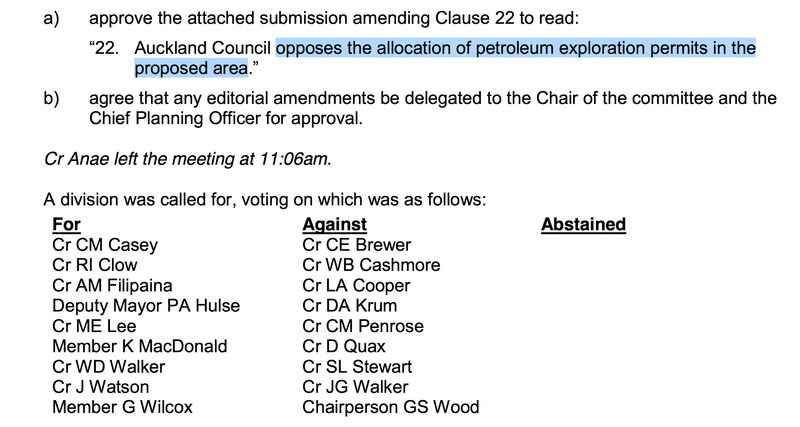 A resolution was proposed that Council opposed the allocation of petroleum exploration permits in the West Coast. Unfortunately the resolution failed, just. The vote was 9-9 and it took the casting vote of the chair George Wood to vote the resolution down. I recently questioned Waitakere Ward councillor Linda Cooper on why she voted against the proposal. She said that she thought there were better ways of expressing opposition to the drilling and also berated those of us who drive cars to Piha and then oppose drilling. This was a somewhat unusual response. I thought the best way to express opposition to drilling was to do exactly that. And yes we all drive cars but climate change makes it extraordinarily important that we transition to a carbon neutral society as soon as possible. Drilling more oil wells will not achieve this. The potential cost of the loss of Maui’s dolphins is immeasurable. Mother Nature is the sum of a complex series of interactions between a huge number of species relating to earth sky and water and the removal of one species can have initially subtle but potentially and gradually profound effects on the environment. And Maui’s dolphins are iconic as well as threatened. If we really are a clean green nation we should be doing everything possible to preserve them. If you want to get involved Greenpeace is running this campaign to try and persuade Auckland Councillors to this time oppose the drilling off the west coast. The Waitakere Ranges Local Board will be expressing its opposition.